Grassroots clubs get the chance to take on Premier League giants’ youngsters in tournament. THE grassroots game mixed it with the professionals on Sunday as academy teams from Premier League sides Liverpool and Brighton added Market Road to their testing away days. Camden Elite, Kentish Town Football Academy, European Football Academy and Pro Touch SA were flying the flag for Camden and Islington at the Pro Invitational and Community Festival, which also welcomed Championship teams Queens Park Rangers, Nottingham Forest and Millwall. After a day of nail-biting action Camden Elite, led by player-of-the-tournament Isaiah Djoboga, won the Under-11s Cup. National League side Leyton Orient won the Under-11s Plate. 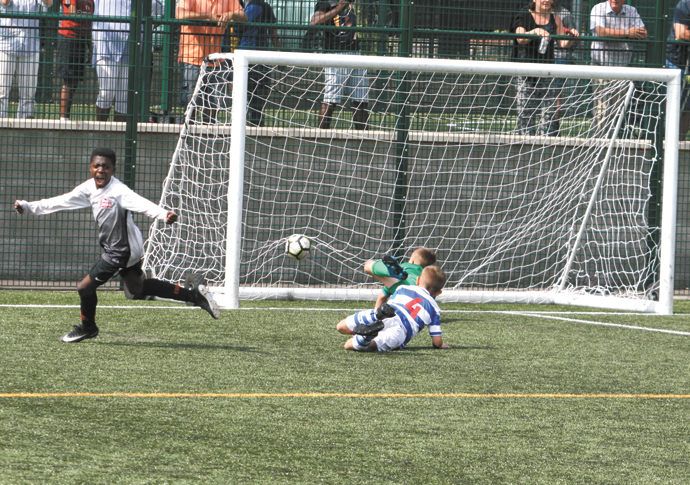 Illecto Academy, from north Finchley, netted further success for the grassroots game by winning the Under-10s Cup, while QPR won the Under-10s Plate competition. Zahid Hossain, academy director of Pro Touch, who hosted the event, said: “It was a great day of football. The atmosphere was amazing, and seeing all of the players, parents and coaches go through such a range of emotions made all the hard work put in behind the scenes worthwhile. Aspiring players looking for proof that they can make it in the top ranks just needed to look pitchside, where a number of former Pro Touch players who have since progressed in the game turned out to watch the action unfold. The list included Kemal Wilson, who now plays for Crystal Palace, Freddie Winfield, who is at Watford, Haru Maitani, who is on the books at Fulham, and Jesse Aldridge, who is at QPR.